With space at a premium, some Manhattan apartments don't offer much room for anything beyond the bare minimum. New York City resident Christine wanted a stylish makeup area with a vanity. But where to put it? As it turns out, she had a storage closet that had become a dumping ground for all of life's detritus. What about using that space to transform her closet? With the help of a handyman, Christine built out the storage closet into an area that tends to all of her personal needs: clothing, makeup, and accessories. A custom-fit vanity, lit with exposed bulb Hollywood-style lights, provides a bright and welcoming place to apply makeup. Tiny shelves hold accessories, makeup, and shoes. Liz Marie was embarrassed by her linen closet. As if the disorganized piles of junk wasn't bad enough, she had to contend with the closet's miniature size. Because she couldn't change the size of her Lilliputian linen closet, Liz Marie decided to maximize every possible square inch with baskets from Michael's. Tiny chalkboard signs identify contents. Best of all, this closet makeover took only one hour. Closets, in general, are disorganized. But one type of closet tends to bear the brunt of this disorganization: the foyer closet. Home blogger Kelley Nan felt that her closet wasn't the worst in the world, but it was far from acceptable. It was time to swing into action. A particularly sweet deal on the Elfa wire shelving closet system at The Container Store prompted Kelley Nan to transform her hallway closet from an uninspiring place to a bright, neat-as-a-pin storage space. A big, walk-in closet is just as susceptible to mess as a small closet. The only difference is that the mess takes longer to pile up. Home bloggers Kevin and Amanda had piled up quite a bit of stuff in their master bedroom's walk-in closet over the years that could only be cured with a bold, decisive closet makeover. This closet makeover stripped out some of the flimsy wire shelves and replaced them with solid cabinets and shelves. Because shoes cluttering the floor was a major issue before, the makeover tucked away all of the shoes in melamine cabinets with closed doors. Home blogger Jordan Reid is an innately organized person, so chaos was not the defining element of her bedroom's closet. The problem? Size. Her closet was way too small for her needs. Then, Jordan had a brilliant idea. When Jordan Reid realized that her three-year-old daughter's bedroom closet backed up against her own closet, she had a stroke of genius. She removed the non load-bearing wall from the back of her closet, instantly doubling its size. This gave her enough room for more clothing and even enough space to add a pouf. Embarrassing, bad, and highly inconvenient are all of the terms that Crystal from the home blog The Weathered Fox uses to characterize her pre-makeover linen closet. Worst of all, when she needed to go into the attic access door, she had to disassemble much of the linen closet. Linen closets can get pretty dinged-up, so much of the work of this makeover centered around fixing drywall gouges with Spackle. By putting everything in boxes, it is easy and simple to remove items in order to reach the attic access door. On the good side, lifestyle blogger Erin Spain had a big closet. On the bad side: everything else. First, it had an awkward, L-shaped footprint. Walls were dull. She shared it with her husband, too. Simply put, it did its job, but it did not make her heart beat fonder. That plain, uninspired closet is now a place of beauty, with the addition of Tan Fawn wallpaper from Walls Republic. 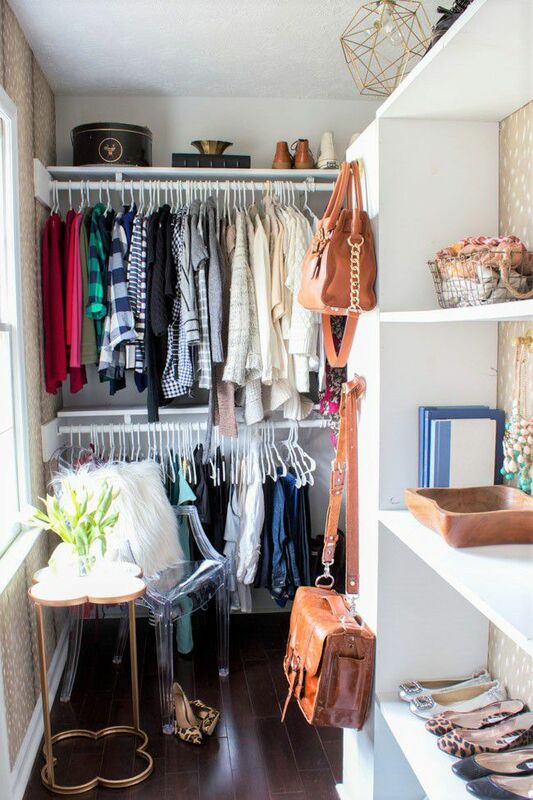 Erin's closet, in fact, was decked out like a mini-room: new light fixture, loads of hooks and other places to put pretty things, a flashy transparent "ghost chair," brass accent table, and other fine items that make her closet a fun place to be. A walk-in closet is not an automatic winner in the closet game. Case in point, home blogger Marie's master bedroom walk-in closet. Sounds fancy? Not so much. Instead, try terms like: odd, small, and wasted space. Those are all words (and plenty more) that Marie used to refer to her triangle-shaped, dark walk-in closet that had only one clothes rod. She had her work cut out for her. After the closet's makeover, it is utterly transformed. Tons of new shelves hold clothing, shoes, bags, and accessories. That single clothes rod was doubled up, so now it can hold twice as many hanging clothes. And while natural light will never be able to see its way into the closet, the space is loads cheerier with a coat of bright paint (Polar Bear, from Behr). It certainly wasn't a dark pit. But the hallway closet of blogger Kristyn (Lil Luna) seemed to have the knack of making school backpacks disappear just at the last minute before leaving for school. It wasn't beautiful. It had permanently become the home of a freestanding coat rack. She could live with it, but why? It was time for a makeover. After the closet makeover, there is a place for everything, and everything in its place. Relaxing gray paint (Mindful Gray, Sherwin-Williams) with stenciled white polka dots gives the closet a fun, lively feeling. Hooks screwed into the wall replace the coat rack. Few closets in need of a makeover can lay claim to this obstacle: a ventilation flue. For Christy, of the popular home blog Confessions of a Serial Do-It-Yourselfer, the flue was just one of her many worries. Worst of all, the space had almost no shelves or rods to speak of. Leaving the flue in place, Christy extensively built out her closet with top-to-bottom shelves, ultra-strong rods for her many clothes, and custom-designed slots for wicker baskets from her local Michael's.